1 Place potato cubes in a saucepan, cover with cold water, salt lightly and bring to a gentle boil. Lower heat and cook gently until tender. 2 Peel celeriac with a sharp sturdy knife, ensuring all deep roots are removed. Cut into chunks and as the pieces are prepared, put them in a bowl of water with lemon juice to slow discolouration. When all the celeriac has been prepared, drain and cook as described for potatoes. 3 Drain potatoes, then return them to wiped-out pan and set pan back on heat for a few minutes to dry off. Drain celeriac and let it steam dry in the same manner for a few minutes. Pass potatoes and celeriac together through a mouli-legumes, or mash by hand. Beat in butter, ¾ of a teaspoon of salt and enough hot cream to make a creamy purée. 4 While vegetables are cooking, sizzle bacon in a little butter until crisp (this can be done ahead). Tip mash into a heated serving bowl. Tilt pan and scoop off bacon. 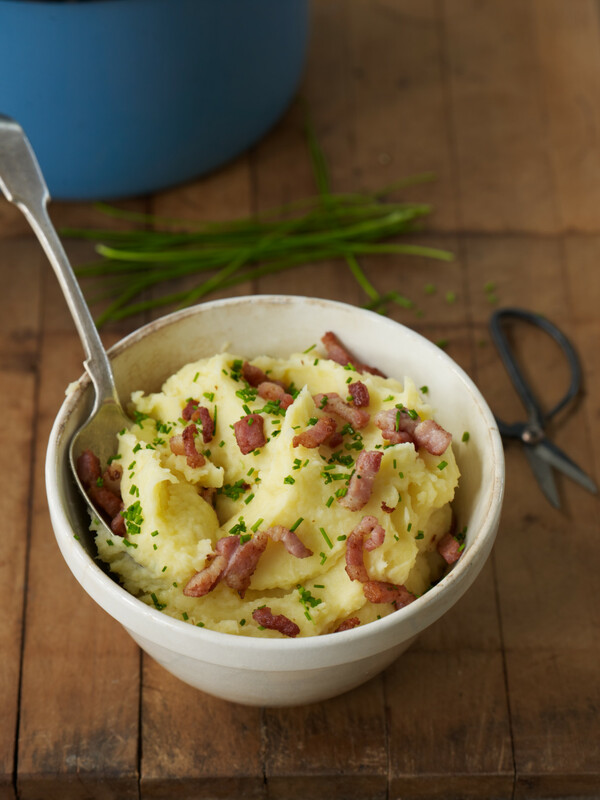 Scatter mash with bacon, then chives. Turn 2–3 times with a spoon, then serve.